App Store Rankings Artificially Boosted in China via Compromised iTunes Accounts? A Sina Tech report points to a popular app discussion forum called iApps.im (via Tech in Asia), where a couple of days ago users began to complain that their “Purchased” apps list contained many more apps than they have actually downloaded. Considering the recent hack that forced Apple to take its developer center down, there could be a connection between the two. The editorial team of iApps.im has issued a press release on its blog, pointing to what users have reported. The phenomenon was suspicious, because they were phantom downloads, so the editors have started their own investigation. 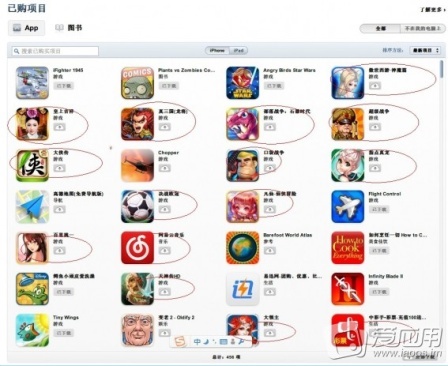 After analyzing the downloaded applications, iApps editors found that many of them rank high on Apple’s China charts. According to their findings, this could be the result of a hack that allowed access to user accounts, and exploited them by downloading the apps to promote them. As a Quora entry says app downloads are among the several components to the algorithm used in determining App Store rankings. There are several components to the algorithm, most of which are unknown. We know that the algorithm uses a weighted average of daily applications sales. Most of the weight is placed on the 4 previous days of sales and nearly none of the weight is placed on days before that. What’s interesting is that there were no reports about money charges. The iApps editor team also speculates that the “hack” could be related to jailbreaking, as many of the affected users reportedly own a jailbroken iDevice, and they use third-party syncing apps. It may or may not be linked, but because the Apple developer site is down, many users complained about password reset emails. There were two similar cases reported on Apple Support Communities: one in 2011 and one last year. Did you notice something unusual lately among your purchased apps list?